Red shirt, with recurring bands of ten thin shadow hoops, and navy blue winged collar and cuffs. Navy blue rectangular insert beneath the neck, with two navy blue buttons fastening to an overlapping navy blue rectangular insert, via a white underlining. Embroidered emblem on left breast, with 'ENGLAND' in capitalised white lettering inside a navy blue panel above the emblem. Two embroidered navy blue concentric diamonds on right breast, with 'UMBRO' in capitalised navy blue lettering underneath and a registered trademark placed above the gap between the 'R' and the 'O' in navy blue. White number on reverse and in centre of chest in the same font as on the white shirt. White shorts, with white drawstring. Two embroidered navy blue concentric diamonds on left thigh, with 'UMBRO' in capitalised navy blue lettering underneath and a registered trademark placed above the gap between the 'R' and the 'O' in navy blue. Navy blue number, in the same font as on the shirt, above the Umbro logo on left thigh. Embroidered emblem on right thigh, with 'ENGLAND' in capitalised white lettering inside a navy blue panel above the emblem. 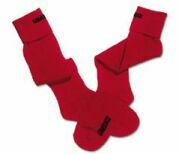 Red socks, with 'UMBRO' in large capitalised navy blue lettering across turnovers and along right side of footing. Against Germany in Charleroi, the player's surname was worn above the number on the reverse, in capitalised plain white lettering in the same font as the numbers. The shirts worn by the Neville brothers also included their first initial i.e. G . NEVILLE and P . NEVILLE. 30 players wore this uniform. 4 players won their first cap in the shirt, including two centurions; Steven Gerrard and Frank Lampard. Each won their last cap in England's last match of the 2014 World Cup. It was Gerrard's 114th and Lampard's 106th cap. Steve Guppy won his one and only international cap on this shirt's first appearance, against Belgium. 4 players also won their last cap in the shirt. Tony Adams, on his 66th appearance and Graeme Le Saux, on his 36th, both ended their international careers as both Kevin Keegan and the old Wembley Stadium also made their final bows, against Germany. Jason Wilcox won his last cap against Argentina. Each of his three appearances was in a different kit and under a different coach (Venables, Wilkinson and Keegan). 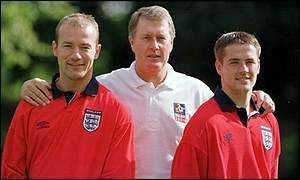 Shearer's second goal in this shirt gave England their first victory against Germany in a major tournament since 1966. Redknapp's strike, against Belgium, was his only international goal. Adams' goal was his fifth and last for his country. Shearer was an ever-present captain throughout Kevin Keegan's time in charge, both in this shirt and in the 1999 white kit. He retired from international football at the end of the 2000 European Championship finals tournament. 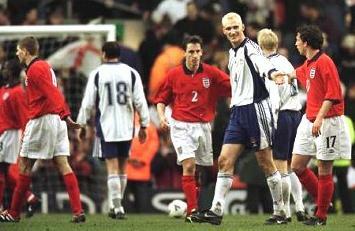 Adams captained England against Germany in Wembley's last match. It was his 60th appearance at the old stadium for club and country, more than any other player and it proved to be his last game for England. Beckham celebrated his first competitive game as captain and his first home fixture with the armband, by firing home England's winner against Finland at Anfield on the last appearance for this shirt. England returned to plain red, relatively unadorned yet extremely attractive, with this Umbro jersey, which was even devoid of the non-contrasting diamond patterns that had been sneaked onto the white uniform. With Kevin Keegan desperately trying to restore confidence to a team that stumbled into qualification for the 2000 European Championship final tournament, he used the nostalgia of England's only world-beating eleven by dressing the current team in the same colours as the heroes of 1966, at every opportunity. This, of course, was also exploited by Umbro in their replica sales marketing. It meant that England wore the shirt almost exclusively in home games, apart from one celebrated tournament victory against the Germans in Belgium, and it appeared to be a lucky kit, despite England's first round exit with two defeats in their white shirts. So, when it came to giving the old Wembley Stadium its final performance, a World Cup qualifier against Germany, it was only fitting that the teams should be wearing the same colours as in their most memorable encounter, at least within these shores. Then, it all went sour. It was a miserable wet day, England didn't perform, Germany stole the points and Keegan resigned. It couldn't get any worse and, fortunately, it didn't. The kit was worn one last time, as England rose from the ashes and dispatched the Finns to get their ultimately successful World Cup qualifying campaign back on track, under their new Swedish coach. 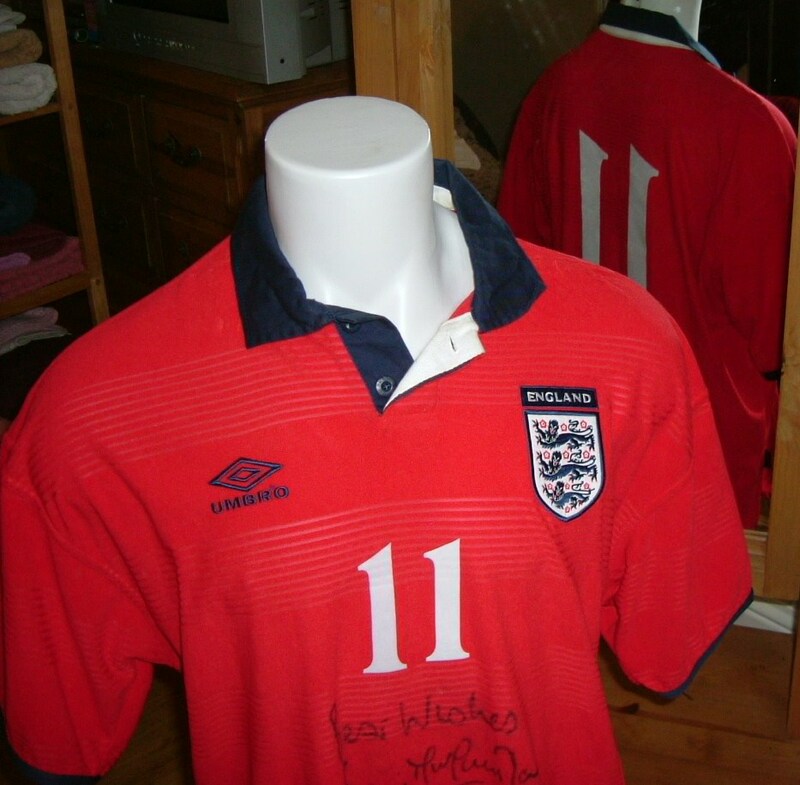 The number-six shirt (top right) was issued to Sol Campbell for the game against Finland and it is reproduced here by kind permission from Richard Clarke's 'Three Lions - England Match Worn Shirts' Facebook Collection.